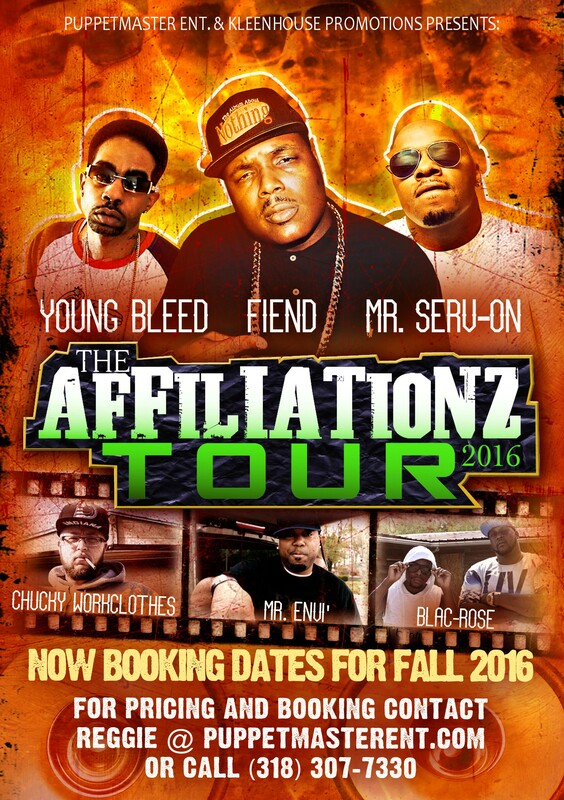 PuppetMaster Entertainment is now booking dates for the 2016 Affiliationz Tour. This year the tour will be headlined by former No Limit artist Fiend, Young Bleed and Mr. Serv-On. Joining them will be up & coming acts Mr. Envi’ (Bossier City, La), Chucky Workclothes (Indianapolis, In) and Blac Rose (Birmingham, Al). Contact Reggie at reggie@puppetmasterent.com or call 318.307.7330 for inquiries and more information. Here Comes The Affiliationz Tour 2K14!